Watch a selection of segments from the show on our Video Site. Ever since our children were babies we’ve played music together. We started with nursery rhymes before bed and sing along songs, in the car, on the way to grandma’s house. As the kids grew older they learned to play their own instruments. Tahnis took up the violin at the age of five. 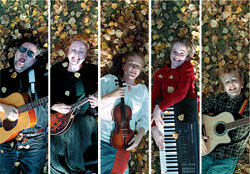 Ceileigh began by taking piano lessons when she was eight but switched to the bass in her teens. Jesse picked up the guitar after disdaining the violin when he turned 7. Over the years our family sing-along developed into a Saturday morning music ensemble. Sitting on the couch after breakfast each of us would sing or play a tune that we enjoyed, the rest of us joined in, adding harmony parts or other instruments. We had one annual public performance, every August we played Alberta’s littlest folk festival at the home of Dan & Connie Sinesac. The first time we graced the stage Jesse was so small that Becky had to hold him in her arms so that he could sing into the mic. Now we are all grown up… in facts some of us have grown a little too much, but we still enjoy singing and spending time together. Thanks to the ipod we now know how to identify our musical sound. In your ipod you have all sorts of music, right? Maybe you like rock, rap, country and classical. No one can pigeonhole you're taste. And you know that when you put the device on “shuffle” your likely to get a terrific random mix of the music you like. That’s how we see our music, we play on "shuffle". 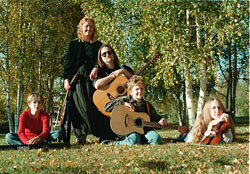 Our music is mostly acoustic but our tastes are as varied as the talents of our family. 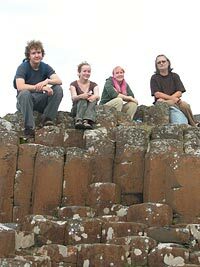 When we can, we try to sing songs written by Canadians, or those that honour our Celtic and Native roots. We also have a few of our own. Singing and playing music is a natural and necessary part of a full and happy life. And we hope that you can join us singing and playing and (don’t forget) eating our way through Europe. We live in Edmonton, Alberta on the south side of the river, in an area just off of Whyte Avenue. Whyte is a street renowned for its art festivals, theatres and music. It’s as eclectic as our music. And it’s here that we made a lovely little CD when we were all still quite young. Its still available and its called “Off Whyte”. Like us it has a mixed heritage. The songs on it are dedicated to our parents and grandparents: Bertha and Leslie Palmer and Chester and Elzaida Cunningham. To order Off Whyte, please email dave@cunninghamcom.ca. 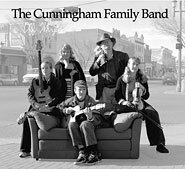 "The Things we do for Love"
In 2002 the Cunningham Family made their first trip across Canada. They were on the way to the banks of the Miramachie River, taking Grandpa Leslie's ashes home to New Brunswick. As they went, they stopped to play music on the streets of many of Canada’s major cities. They also made a short video for the producers of "The Things We Do For love". This was our Christmas present to our friends a few years back, but it’s still nice to hear anytime. It’s one of our favorite songs.